The Taipei Economic and Cultural Office in New York and Taiwan Tourism in New York would like to invite commuters onboard the New York subway shuttle train, S Train, running between Times Square and Grand Central for a ride to Taiwan in Oct. 2018. 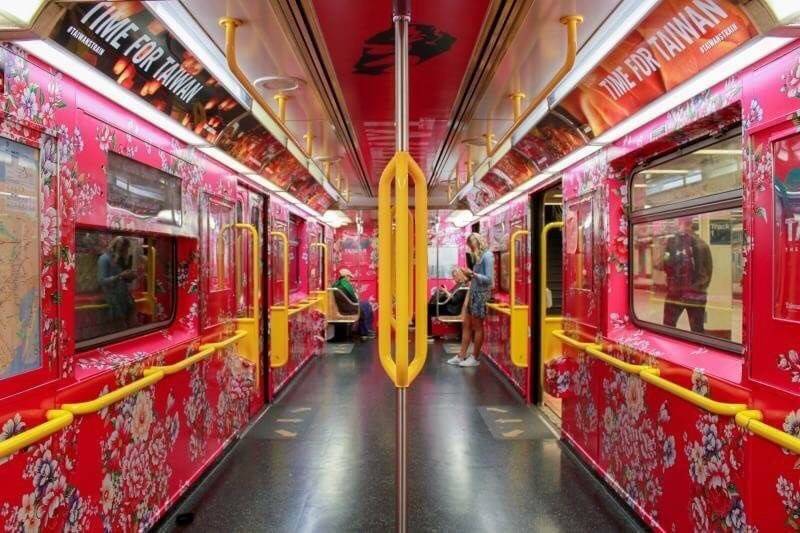 Running through the 28th of this month, the S Train is wrapped in vibrant colors and eye-catching images to represent the beauty of Taiwan’s coastline and mountains as well as its people. The interior spotlights Taiwan’s favorite tourist attractions, offshore islands, historic towns, and local cuisine, giving commuters a peek into Taiwan’s diverse and vibrant culture. The artwork of the train is designed by Meng Chih Chiang, a Taiwanese award-winning visual designer based in New York City, and feature portraits of Taiwan’s indigenous people done by Yosifu, an artist from Taiwan’s Amis tribe who now lives in Edinburgh, UK. Travel lovers are invited to participate in the #taiwanstrain contest to win a round-trip ticket to Taipei, sponsored by Taiwan’s China Airline and Eva Air. To enter, please share a photo of you with the S Train on Instagram before October 28, tag @ttb_na (Taiwan Tourism Bureau, North America) and use the hasthag #taiwanstrain to make sure your post is visible. Two winners will be announced on the @ttb_na Instagram account a week after the end of the campaign. No user commented in " Taiwan Comes to New York Subway S Train "